The Cathedral had a distinctly different look to it when we entered for prayers this morning. 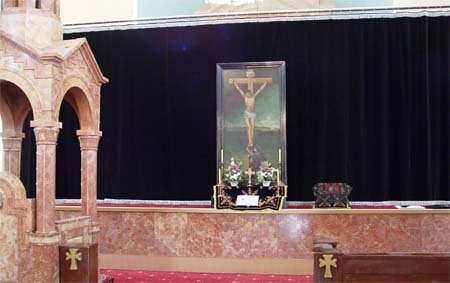 As mentioned in a previous post, during the Great Lent the sanctuary curtain is closed for the full 40 days. The liturgical closing of the sanctuary curtain for Great Lent took place at Saturday vespers, which I attended in the seminary chapel in Bickfaya. The Sanctuary was already robed in the blood red of Armenian Easter, and the curtain was wide open as the service began. But about mid-way through the evening office, to the singing of the appointed hymn, the curtain was closed and the sanctuary, Emmanuel (God with us) hidden from sight as the Armenian Orthodox around the world began the long prepartion of their hearts for the celebrations of Holy Week. They are not alone, the Maronites around the Catholicosate bear wide ash crosses on their forheads today. They, like the Armenians begin Lent on Monday not Wednesday, and it is Ash Monday for the large Maronite community of Beirut today. The offices are particularly impressive in the Armenian Orthodox tradition. Though I am told that certain offices are repeated — Morning Prayers on Monday, Tuesdays and Thursdays, for instance — these too are displaced to mark a feast day or liturgical event. Most festal offices have their own hymnody, matched with one of the several modes for the singing of the office canticles. Here we see Deacon Berj (centre left) leading his side of the split office choir (singing antiphonally, back and forth, with the other). On Saturday, the Armenian calendar commemorated the Council of Constantinople (381 a.d.); and the morning office for the day provides a good illustration for the way the Armenian Orthodox use the liturgy of the daily offices to illustrate the story or exemplify the meaning of a given feast. Constantinople was the second great ecumenical council and 150 bishops attended. At Constantinople, the council fathers were convened to deal with a certain Macedonius who taught that the Holy Spirit was not so much a person as a dynamic power. The council condemned this teaching, arguing that it undermined orthodoxy (correct teaching) where the Holy Trinity is concerned. During morning prayer on Saturday, at one point the sanctuary curtain was closed (a foretaste of what was to happen that evening), this was to represent the anathematisation (the formal act of pronouncing someone accursed) of Macedonius and his followers. After the singing of the appointed hymn describing and theologising the event, the curtains are opened to reveal one of the seminary priests, Fr. Tatoul, wearing an embroidered cope (cape) and using a fine cloth to hold high the Gospel book — all this to represent the triumph of the Gospel truth over the false teaching of the heretics. 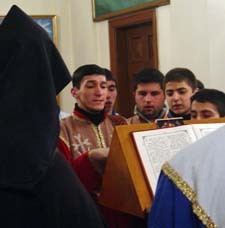 From what I can see, this sort of liturgical gesture, accompanied by wonderful singing, is very common in the Armenian tradition.